I am truly shocked at how many people left me comments. It's been such a boost to read your messages! I am even more excited about these aprons now. (In fact, I spent ALL day yesterday searching for more fabric and putting little apron combos together.) I had no idea that people would love these as much as you all seem to. Thank you so very much for all of your support and the mini pep-talks! I am working frantically right now to get a little online shop going. 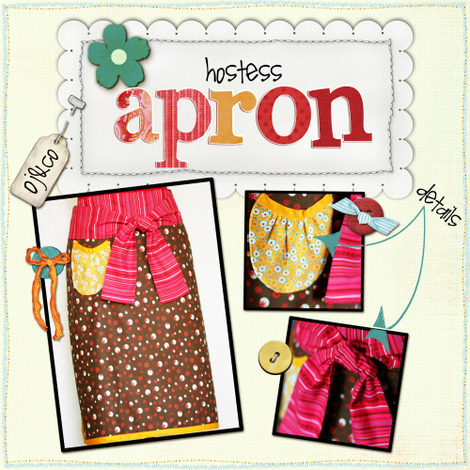 I will be selling my aprons, blingin'blooms (the hair flowers), and a couple other fun kitschy goodies. Until then, if you are wanting a little OliveJuice&Co creation, I'd be thrilled to work something out. Email me at hendrickskim@hotmail.com and I'll get you any details you'd like. Thank you again!!! So since I've been promising another little OliveJuice and Co blog giveaway....here it is! (hehe...I have a blast with these little freebies.) I can't give away a ton of these babies so we'll start with one and see how it goes. I'm not sure how to do it to make it fair. (And really, I don't even know for sure that anyone besides me will even like these crazy things.) Hmmmm...... How about leaving me your name in the comment section and then we will do a little drawing in a few days? How about on Sunday~ Cuz it's my favorite day. So that's it. If you want a chance to get your own little custom OJ&Co apron, leave me your name, and I'll draw out a winner this coming Sunday. Sound good? It should be a really fun time! Bwaaaahahahahahahaha Is this not the funniest thing in the world? I'm especially looking forward to the tetherball tournament and the tots! Yummmmmm :D Talk about some photo opps! Ok, I'll warn ya....this might not be the most appropriate topic, but oh well. :) I seriously die laughing at some of the things Olivia says. Lately she is obsessed with "booboos" (as she likes to call them) and she says something ridiculously funny about ta-tas nearly every day. A few weeks ago she told the lady at the supermarket check-out, " The red milk (whole- it's got a red lid) is for me. The blue milk (1%) is for Mama to fill up her booboos." Talk about EMBARRASSING!!! Apparently she is sooooo confused about me nursing Gray. And the funny part is that I stopped almost 6 months ago. What do I tell her?! When we went shopping for her new bathing suit she picked out this one because "Oh! I like the booboos on that one the best!" And on that note I'll wish you all a good weekend! If all goes well we'll make it out to parade around with all the other carni-folk at the festival and I'll get some good shots to show ya. Wish me luck with the TOTS!